Like all appliances, RV refrigerators can get old, overused and break over years of use. Chances are that you'll need to replace the refrigerator in your recreational vehicle at least once during the vehicle's lifetime. Replacing an RV refrigerator, however, is not the same as a household kitchen refrigerator and requires more planning, tools and maneuvering. Measure the old refrigerator and the space where it is installed. In order to prevent reframing, make sure your new refrigerator fits into the reserved space. Take measurements of the entrance to the RV, as well, since you'll need to fit it through the door in order to remove the old and install the new. Remove the frame screws. RV refrigerators are held in place by frame screws, which have been covered by caps. Remove the caps--they pop off rather easily--in order to access the screws. Once you've located the screws, use a screwdriver to remove them. Remove the screws from the frame base. 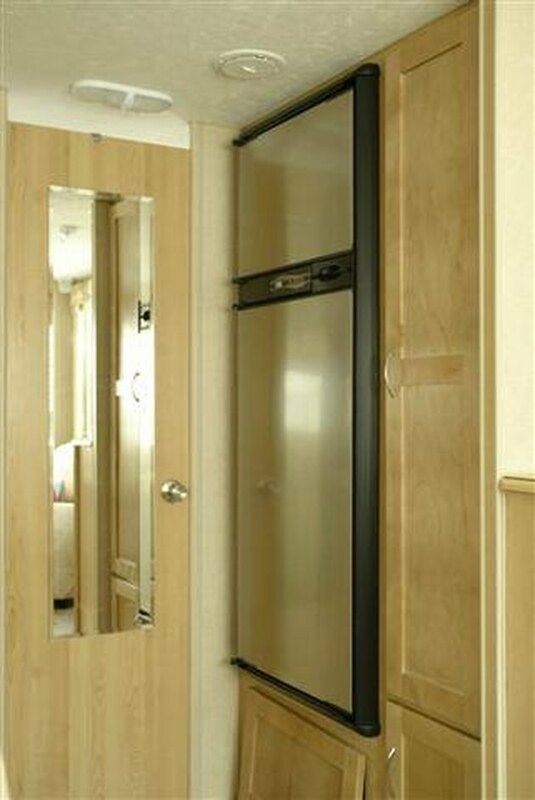 The screws to the frame base can be accessed on the exterior of the RV just outside the access door. These screws are on the bottom corners of the base. Use a screwdriver to unscrew them. Turn off the gas switch. RV refrigerators are run by liquid petroleum gas (LPG). Turn off the LPG before you disconnect the wiring. The ON/OFF switch for the LPG may be on the back of the refrigerator or inside the freezer. Disconnect the wiring. Check again that the LPG is off. Disconnect the main line and the two 12-volt wires on the back of the refrigerator. Remove the silicone caulking. Some refrigerators may be sealed and held in place by silicone caulking. Gently loosen the grip of the caulking by pulling or cutting it. Remove the old refrigerator. Slide the refrigerator out from the framing and away from the wall and lift it. You may need the help of another individual when lifting and removing the old refrigerator.